So declares Dr. Harvey Karp, a Los Angeles pediatrician whose smart-tech baby sleeper, the Snoo, is a game-changer for some sleep-deprived parents. The Snoo has earned rave reviews from baby gear experts and parents alike, including Ashton Kutcher and Mila Kunis. Last year, the consumer products show CES bestowed its coveted baby safety award on the invention. The Snoo is all about swaddling. Just don’t call it a bed. In a video on his website, Papa Karp says the Snoo provides a service “more than being a thing.” It gently rocks and jiggles babies from birth to 6 months old, a period he calls the “fourth trimester,” when — he believes — simulating the womb environment is key to calming babies. 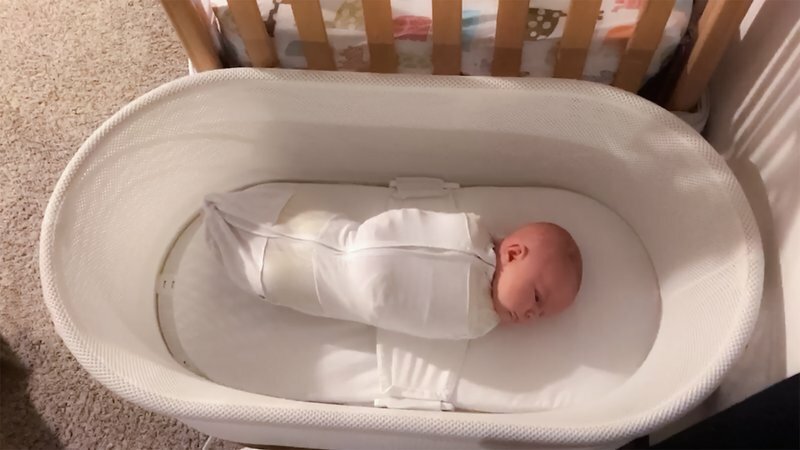 Babies are zipped into a mesh sleep sack after a broad cotton swaddle tightly pins the infant’s arms to the side from shoulder to wrist. The sack is then secured to the Snoo’s frame before the rocking and a white-noise lullaby commence. Karp, who’s also written a book, “The Happiest Baby on the Block,” says infants should be soothed in 40 to 60 seconds. The Snoo increases its motion and noise based on persistent sound from the baby, until it reaches its fourth and final level. If that doesn’t work, it turns off. Parents can adjust settings manually or with an app. The Snoo also comes with an organic cotton sheet and sleep sacks in three sizes. But at $1,160, the Snoo more expensive than many rocking devices — though designer baby beds can run higher. Then her son Jack, now 3 months old, was born. Parental fatigue set in and she found a mommy friend with a Snoo to lend. Karp says babies who aren’t put in the Snoo from birth have a learning curve, and that was the case with Jack. But, says Udo, “It definitely calms him,” so that she doesn’t need to rock him to sleep anymore. While the Zalewskis did become Snoo fans, they opted to return the device before the 30-day trial period was up. The reason: Ruby was colicky and congested and needed to sleep on an incline. The company has since added leg lifts so it can be adjusted. Karp, who worked with designer Yves Behar on the Snoo, says the device also promotes safety, by keeping babies in the supine position recommended for sleep by the American Academy of Pediatrics, and by making it unnecessary for sleep-deprived parents to bring babies into their own beds. About 3,500 infants in the United States die suddenly and unexpectedly each year, according to the U.S. Centers for Disease and Control, and the causes include accidental suffocation in a parent’s bed. Getting babies to sleep soundly can also reduce postpartum depression and marital stress. “The No. 1 stress that new parents talk about is exhaustion,” Karp said. Karp’s team works with companies offering rented Snoos to parents returning to work, foster parents and doctors treating babies born to drug-addicted mothers. He is also working on a plan to offer Snoos for rent at reasonable cost. At the University of Kentucky Children’s Hospital in Lexington, 10 Snoos are available for babies with the addiction and withdrawal condition called neonatal abstinence syndrome, in a state where 15 of every 1,000 babies is born dependent on opioids. Such babies routinely experience disrupted sleep, said Dr. Lori A. Shook, a neonatologist there. Before she stumbled on the Snoo at a pediatrics conference, she’d notice the babies in the eight-bed unit fussing terribly in their bassinets. The Snoos are used in addition to aromatherapy and massage for calming, in a unit that focuses on families caring for their babies. This version has been corrected to delete reference to MIT Media Lab.